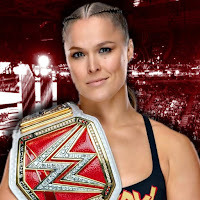 Below is new video of TMZ Sports catching up with The Miz to ask about RAW Women's Champion Ronda Rousey and her husband Travis Browne, who was "banned" from RAW after laying hands on security during this week's episode. Miz gave Browne props for his haymaker and was asked if Browne has what it takes to be a WWE Superstar at 6 foot 7 inches and 265 pounds. "It takes a lot more than being big to be a WWE Superstar," Miz said. "But let's put it this way, the guy's a monster. He's huge. One punch and he can knock you out, one blow. That's not being a WWE Superstar, that's just being a fighter." Miz was asked what kind of advice he would give to Browne. He responded, "I mean, I don't know if he wants to be a WWE Superstar. Get in the ring?" Miz was also asked about Rousey's comments on doing her own thing by going off-script, and WWE having double standards by not firing her for some of the recent statements she's made against the company. Miz said her strategy is working. "I think Ronda Rousey marches by the beat of her own drum," Miz said. "She always has and she's a person that likes to stir it up, make people talk, make people listen, and she's doing just that. It seems to me like she's headed to the main event of WrestleMania, and we'll see if Becky Lynch and Charlotte Flair can do some damage there as well. So, we'll see what happens, I honestly don't know. But right now she's making noise, she's making headlines and you're talking about her, so everything's working about it. Everything's working, right?" The TMZ reporter then asked Miz if he thinks Rousey should at least stick to the script. "It's WrestleMania season, you do whatever you have to do to get people watching, and right now she's doing exactly that," Miz noted. "You're paying attention, everyone's paying attention and that's what it's all about."